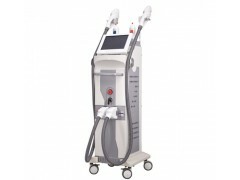 Description:Utilizing OPT (Optimal Pulse Technology) power, square-wave and dual-wavelength cut-off technology, it delivers stable energy and avoids the epidermis burns. The Pmise OPT laser machine is a true aesthetic workstation featuring the option of an OPT. Maximize your investment by offering more treatments to your clients with. 1. Applying the most advanced OPT technology, Pmise OPT Laser is equiped with the adsorbable and sliding hair removal handpiece. 2. Furthermore, it makes hair removal efficient, safe, painless and low cost. It can completely remove the tiny hair, and greatly enhance the efficacy of acne removing, whitening, tightening pores and so on. 3. It is also excellent in the removal of epidermal spots-like pigment, such as freckles and freckles-like moles. 4. All in all, it boasts of its optimized performance, excellent efficacy, more comfortable treatment, ultra-long working hours and near-zero failure rate. 5. One curative effect is more than five times of the other. Water & Oxygen Jet .